I recently picked up a used copy of the 2010 reissue of John Lennon’s Sometime in New York City on the cheap at Amoeba Records in Hollywood. While by no mean Lennon’s crowning solo achievement, I’ve always felt the album was underrated as it’s peppered with some ragged quick and dirty, off-the-cuff, gems. The real “get” though is the bonus disc included in the reissue, the six-song Live Jam 1972 disc that accompanied the original early 70s vinyl release. I’ve never heard a copy of it this clean. 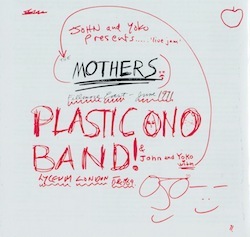 Sounding not unlike a spun-out Velvet Underground bootleg, the set culls two separate performances, the Plastic Ono Band’s 1969 show at the Lyceum Ballroom in London (from a UNICEF charity gig) and their pow-wow with Frank Zappa’s Mothers of Invention at the Fillmore East in New York City from 1971. If you’ve never heard these before, the two performances surprisingly meld together fairly seamlessly and serve as a pretty good document of where Lennon and Ono’s heads were at on a “live” level at the time (recorded at the height of the pair’s ‘radical-era’). Critics of Ono’s vocal tics will find much to pounce on here—so if you fall into that category, this set is most likely not for you. Otherwise, dig in. Thanks much for the post– It’s a Lennon era that I do tend to overlook, and this may be the best material I’ve heard from it. Zappa also released a live version of the Filmore set, and in his release, they don’t wash out the very vocal booing from Mothers fans of Yoko, notably when she solos for several minutes. It’s interesting because one would think that Mothers fans would be used to such weirdness by then. @ Paul – yeah, agreed, I would have guessed she wouldn’t have fazed em at all. Don’t forget the era of the Beatles, and how Yoko was looked upon as ‘breaking up’ the Beatles. She was vilified and hated by fans. So then, they still are harboring bad thoughts of her at this concert. They couldn’t accept her presence as a musician, either. Lennon thought it was a drag, he wanted to do live gigs, but everyone went to them just to see a Beatle. Zappa is the man. I’ve never heard these recordings before. What a cool treat. as a Georgia boy, you should know that the Hampton Grease Band opened for those NYC gigs, making them possibly some of the weirdest most awesome shows in music history. @ bobby – nice man, that is a great tidbit I…I had not idea. was listening to Music To Eat just the other day. I always thought Well (baby Please Don’t Go) was the best on the album. I played that track on my vinyl album for years, then tape and now as a mp3. Lennon had an ear for good tunes, played well and performed before a live audience. Just think what music we missed since 1980. Thanks for posting. I love angry, political 70’s John Lennon and this was a fantastic addition to the lovably hit-or-miss original album. It’s sad that Lennon’s activist legacy is more often remembered as his hippie, bagist bed-ins and “Give Peace A Chance” when the ultimate end was the angry, hard-nosed proto-punk of “I Don’t Wanna Be A Soldier Mama”, “John Sinclair”and “The Luck Of The Irish”.